After a very long absence, I’m back. My postings may be sporadic but I’m trying. My blog has been very neglected, along with a lot of other things, due to illness. Starting to feel like myself again and this is my first card in a very long time. The color challenge over at Splitcoast calls for neutrals today: Whisper White, Basic Gray and Sahara Sand. So no, this is not a black and white photo LOL! And, our dessert option for today is stripes. I stamped the LaBlanche image in Basic Gray and then proceeded to use my waterbrush and my Sahara Sand stamp pad to lightly color the image. Next I used my Sahara Sand marker to add more depth. The shading on the card was done both with the waterbrush and the marker. Then using a Stardust Gelly Roll pen, I added some highlights. 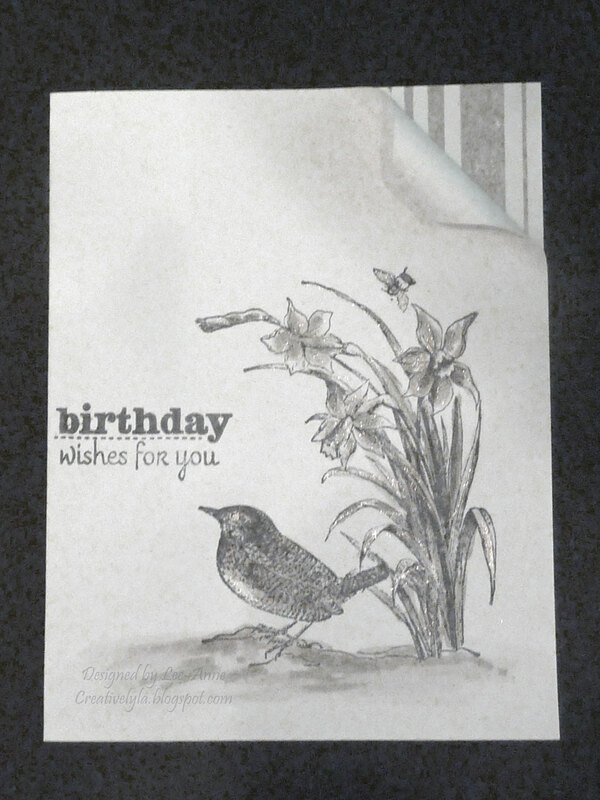 My choice to add the dessert option was simply stamping a striped image down the right inside part of the card. And, finally, the sentiment was stamped in Basic Gray. That’s it for today! Have a terrific Tuesday everyone!